Maron is an uncommon annona with fibrous fruits native to Central America, the Amazon, and islands in the Caribbean. In its native range, it grows at altitudes from sea level to 650 metres. Maron tree greatly resembles a sour sop tree, especially in terms of tree, leaf and fruit characters. That is why it is also called the mountain soursop. A small deciduous tree upto 10 m high with spreading crown and dark green or brown bark. Leaves alternate, distichus, petiole short , oblong or elliptic, 7-18 cm long and 2.5-8 cm wide, with tapering apex, and rounded base, leathery, dark green above and pale green beneath, glabrous and glossy. Flowers solitary or in pairs in older twigs, peduncle stout; sepals 3, broad and pubescent; petals 6 in two whorls, inner three rounded; stamens numerous and rounded in rounded mass. 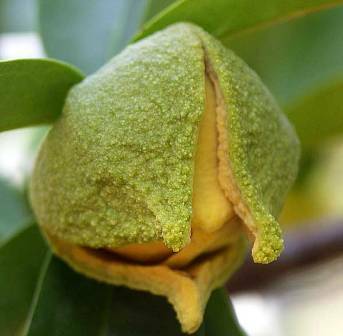 Fruit, a syncarp, formed by fusion of numerous carpels, 15 cm long, 7-13 cm across, green, turning yellow at maturity and covered with 4 mm long spikes; pulp yellow, subacid. Seeds numerous, light brown, oblong, 18 mm long. 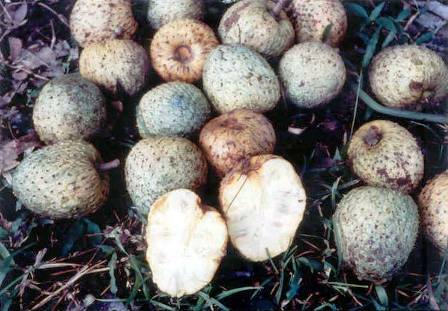 Maron fruits are eaten by local people. These are fibrous and not as tasty as sour sop. These are, however, very suitable for juice making. Maron is used to treat many ailments in local medicine and South America and the Caribbean. Fruit, seeds, bark, leaves, and roots of maron have all been used to treat intestinal parasites, coughs (including asthma and bronchitis), inflammation, diabetes, and hypertension, among many. 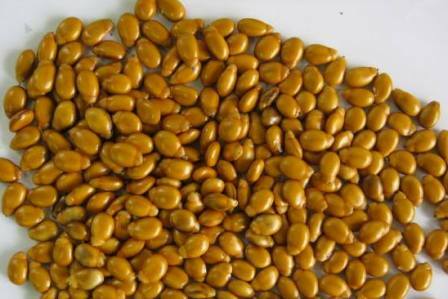 Maron has become popular as a nutritional medicinal supplement and is sold in health food stores and online. Data on quantities harvested and sold commercially are difficult to find, but least one supplier claims that materials are harvested in the wild in Amazon rainforests. 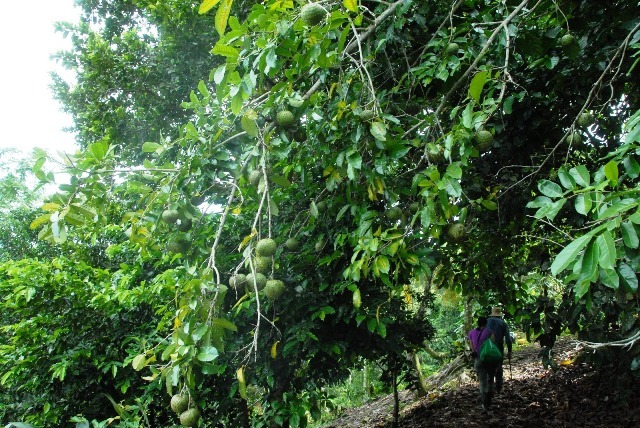 As already stated, maron is cultivated on a limited scale for its fruits. It is adaptable to a wide range of soil types. It is also hardier than many other tropical fruit trees and can withstand temperatures even below freezing for brief periods. Maron trees are easy to multiply its seeds germinate easily. Maron seedlings are sometimes also used as a rootstock other annonas.